Die raum is probably the smallest project space in Berlin. 5m2 is where the magic happens. The installation Lembrança de Brasilia (memory from Brasilia) is part of an ongoing project that artist Laearcio Redondo made here in light of the Project Space Festival. He shows that one can go even smaller. Redondo divided die raum diagonally in half, leaving only 2,5 m2 for the exhibition. Sometimes, and also for this project, die raum has no door. The transition between the private and the communal space becomes blurry. Literally. People have been rubbing through the charcoal pattern, writing their name in dust. By dividing the space diagonally, the floorplan gets the shape of a triangle. It matches the triangles drawn with charcoal on the wall. The pattern was inspired by the Brazilian artist Athos Bulcão (1918-2008), who played an important role in the coming into existence of the new capital of Brazil; Brasilia. This city was completely designed and built from scratch in only 4 years time, finished in april 1960. The groundplan of the city was designed by Lucio Costa in the shape of an airplane. The central axe houses all the government buildings. The wings are meant for living. 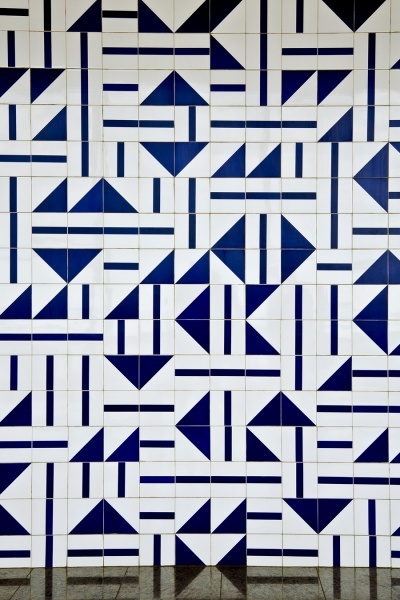 The work of Bulcão can be found in every corner of this new city, in the form of tiles. Bulcãos mostly abstract patterns are colourful, rhythmic, playful and also very democratic. They are meant as open patterns, for people to play with. Bulcão actively tried to involve the workers who built them in the forming of the pattern and thus involving them the end result. Here at die raum something similar is happening. Because there is no door, people can get (unknowingly) involved in the pattern and leave their mark. They also change the end result. By allowing this Redondo focuses not only on the beautiful patterns of Bulcão and his modernist ideas of building a bond between art, work, life and the city. He also creates a new bond between past and present and questions what has become of its (maybe) utopian ideas.